About to appear in AFSB interviews and looking for undertaking certificate? Undertaking is compulsory for all candidates who are appearing in SSB interviews conducted by AFSBs. View and take a print out of AFSB undertaking certificate here. Indian Air Force has announced the AFCAT 01/2013 results on 21st March 2013. AFCAT exam was conducted by IAF to shortlist candidates for 135 GDOC (Permanent Commission). 28 Short Service Commission Men, 44 Short Service Commission Women courses which are likely to commence in January 2014 at Air Force Academy. Based on the educational qualification and preference of entry of a candidate, IAF is announcing AFSB interview dates one by one now. Recently AFSB interview dates of Meteorology branch were published on the official website of Indian Air Force. 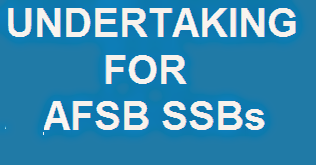 All candidates who are appearing in SSB interviews in any of AFSBs must submit certificate of undertaking. Here we have provided the undertaking certificate required for AFSB interviews in MS Word document. Just open it and take a print out. Fill up the undertaking and that's all. View / Print AFSB undertaking certificate.